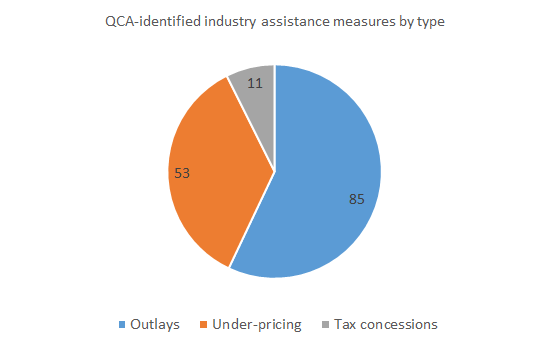 The QCA has released a Draft Catalogue of Industry Assistance Measures (available at this link), and it shows nearly 150 ways the Queensland Government assists industry, many of which I’ve no doubt have zero public policy rationale and are a total waste of taxpayers’ money. 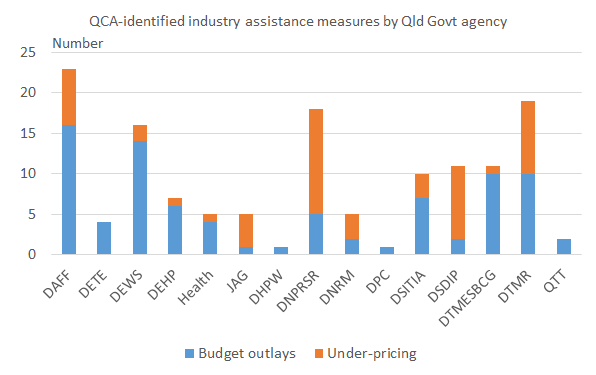 The charts below show splits by type of measure and by department (for budget outlays and under-pricing of services, as the relevant department wasn’t identified for tax concessions, although I’d assume it’s Queensland Treasury and Trade for most of them). With so many cases in which Queensland Government services to industry are under-priced (e.g. leases of port land for bulk sugar storage sheds, leasing of railway corridors at peppercorn rates, benefits to tourism providers from the use of infrastructure in national parks), there is a huge opportunity to increase revenue and improve economic efficiency through better cost recovery. Unfortunately, we don’t know from the catalogue how much revenue is forgone through under-pricing, nor are estimates of the value of budgetary outlays or tax concessions provided. It seems obvious to me that these are important data items for an industry assistance review, and, if funding or cooperation from Government agencies is an issue, the QCA should seek intervention from the Treasurer. This industry assistance review is a big opportunity to identify some major budgetary savings, and the Government should give it a high priority. The QCA is seeking public comment on the Draft Catalogue by 3 November. This entry was posted in Industry policy and tagged corporatewelfare, industryassistance, nationalparks, qca, qld. Bookmark the permalink.